Both inflow/outflow and bridge system cannulas are available in the series of metal cannula sets. 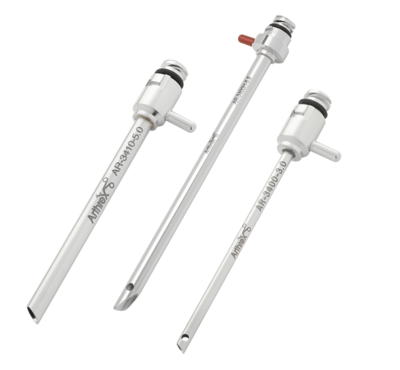 The cannulas feature a J-lock connection, and are offered in fenestrated and nonfenestrated tip designs. The proximal ends of the cannulas lock into most Arthrex shaver blade/burr hubs, which eliminates cannula leaking. The metal cannulas and obturators are sold separately and in sets. The unsealed cannulas come in 3.0, 4.5, 4.75, 5.0, 5.5, and 6.5 mm inner diameters. There are no educational resources available.